This new and compact sandblast gun from Gunson Tools (part number 77155) fires dry abrasive particles at high speed, quickly removing rust, scale, old paint etc. Ideal for cleaning pitted surfaces, crevices and other hard to reach places, the gun is designed for performance and ease of use. The gun works with a workshop compressed air supply (recommended operating pressure 90psi) and features a fully adjustable control valve. You can adjust the amount of blast media that flows through the sandblaster and the control valve also gives you the ability to completely restrict the flow of media if you require air only – this can come in handy to clean the work area after blasting. The gun is gravity-fed (600cc capacity media container), which is a more efficient method of delivering blast media directly to the 5mm nozzle; the gun can, therefore, be used in multiple positions while still ensuring a steady media flow. 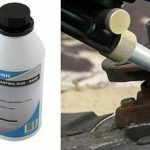 It is compatible with many different media types and is supplied with a 600cc bottle of brown aluminium oxide, a tough, sharp, reusable shot-blasting abrasive. Replacement abrasive bottles are available (part number 77156). This blast media offers a rapid cleaning rate and very low dust levels. Lightweight and tough, the Gunson 77155 offers effective surface cleaning and treatment and is available now from your local stockist. Typically priced at £68.59 inc VAT. More details from www.gunson.co.uk ENDS. Print article This entry was posted by admin on January 31, 2019 at 9:41 pm, and is filed under News. Follow any responses to this post through RSS 2.0. Both comments and pings are currently closed.